All ready to be bludgeoned with a big stick on Saturday. OMG! 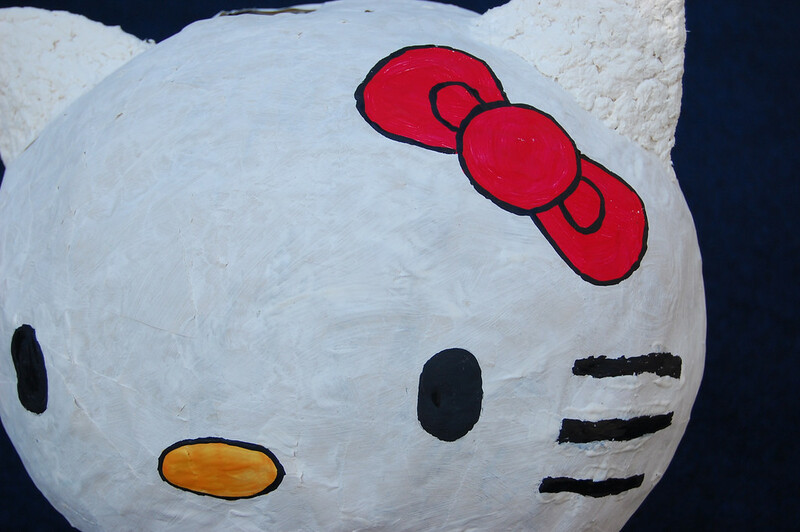 I've always wanted to smash hello kitty's head in! You rock! I just wanted to pop in and say that I've been following the preparations for the party and It's all looking totally cool and froody! I've been having daunting feelings about sorting out the next party after the pirate-mermaid-superhero extravaganza last year, but you've given me renewed enthusiasm and vigour to get the gears in motion for the turning five party at the end of this month! Wow. That is magnificent! She helped to paint that? Impressive! Please take lots of photos at the party and post them! Can't wait to see all the kitty stuff out and the kids' reactions! you are like SUPER MOM!!!! love love love your blog. i'm so glad I came across this site. 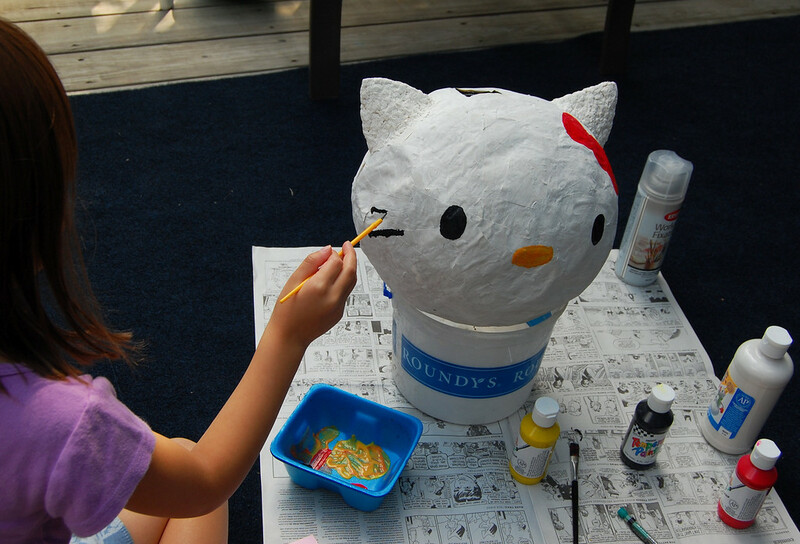 My daugher will be three the end of september and we too are going with a hello kitty theme. 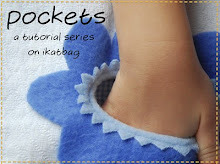 I am starting to learn to sew.....but am terrified of sleeves and have no clue how to do the cute elastic casings. I thought I was doing good by printing off kello kitty photos and taping it the plain wrapping paper. HAHA. You Rock...keep it up! KM: Yes, poor Kitty. Ha ha! All the best for your own party. Daunted or no, I bet it's going to be so fabulous! I was so unmotivated that I put it off till three weeks (or so) before and my mother-in-law was asking if we were having a party at all. So sighed a big sigh and plunged right in. What keeps me going is E's enthusiasm at being in on every moment. Well, I figure that any party that has cardboard and fabric can't go too badly. Van: No, E did the whiskers and the white background over the whole head. Heidi: As they get older they want more crazy details! 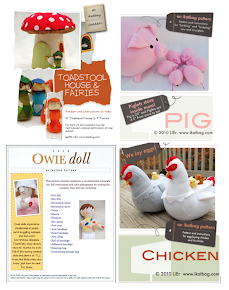 Your 3-year old is going to love her party simply because you did it for her! We never even thought of wrapping paper -erk, in fact I'm not sure I even have all the presents bought yet. Help. That's a cool pinata. How did you do the ears? It sounds like you've put together a fantastic party, and I love that Emily has been involved every step of the way. turned our really cute. You know your heart will fall when they crush it but I know the kids will just love it! That is so creative! Hope you share pictures of Hello Kitty's demise. OK piniata lady, I need some help! We did two coats of gluey paper on our hunormous balloon out in the sun, the balloon expanded in the heat. Damn youuuuu physics!!! 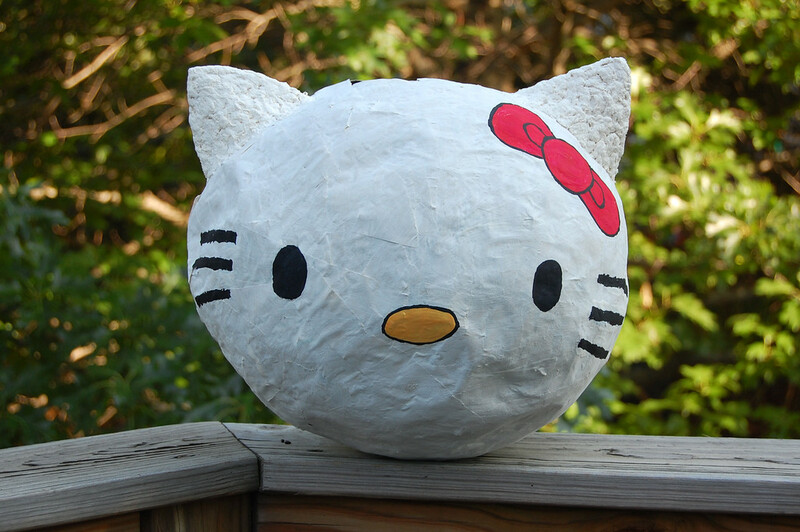 and tore the paper as it dried, so I did another three coats when it was cooler and it's kinda gnarly but mended, so how many coats did you do to enable hello kitty to be smashable but up for a good beating? Hi KM: Just before I applied Coat #2 of gluey paper strips (Coat #1 was dried), I heard the ominous "BANG!" too. Was convinced the whole thing would collapse there and then but it held, if a bit bumpy and sunken at parts. I applied two more coats of gluey paper strips (Coats #2 and #3), then Coat #4 of white paper (butcher paper, I think it was). The white paper was to faciliate painting it later - didn't want to waste a whole gallon of white paint trying to cover newsprint. So 4 coats total. Reinforce the opening with some cardboard pieces where you poke the needle in (I didn't poke a hole to thread a string through because I was afraid it might tear). Good luck! Ahhh, thank you! All is not lost then. I will definately be following your butcher block paper plan. This sucker is going to be orange (jack o lantern). My freind back in the UK has made me promise that I will wait for her to visit before I make one of Frank Sidebottom's head. I'll let you know how it goes! And I'm using K's marshmallow fondant on the superhero cake too. Yay blogland! from preschool, my girl wants hello kitty and my boy wants cars, monster trucks, or spider man. So this should be interesting! I think I can do this pinanta thing, and since my little girl is reading over my shoulder, she's all over it!